The itineraries set out in this section are the ones we consider classics and are mainly aimed at the younger riders. This is just a small selection of the routes as for instance the guidebook just for around L’Argentiere contains details of 58 separate rides. 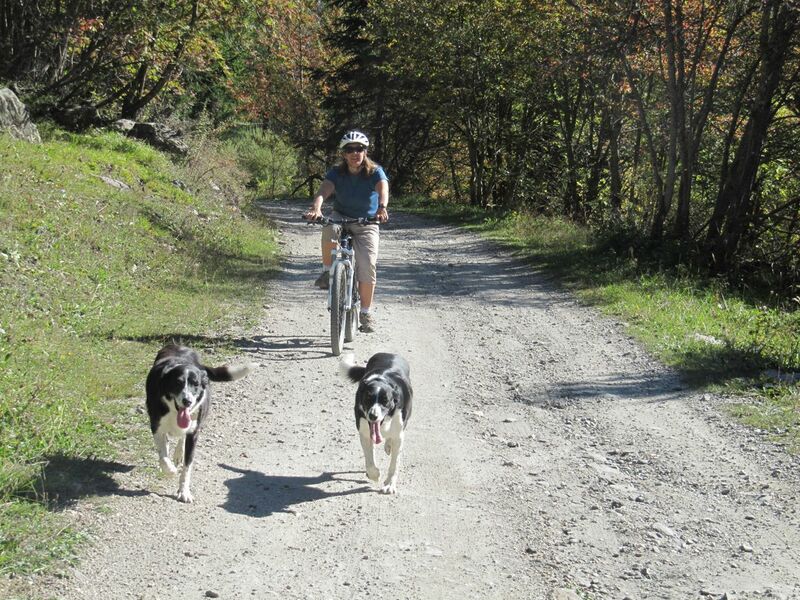 Nice accommodation, ideal for mountain biking is available in Argentiere, Vallouise and Briancon. Most of these rides can be done from May to November, but for the ones which go higher you will have to check in early season whether they are free from snow. These descriptions are indicative only. From Pamplinet take the river right and follow down the track. After a couple of kms the track crosses to river left and enters a wooded section. Here you can follow the pain marks on the boulders and enjoy an easy section of single track winding through the woods. This area is also excellent for a picnic and/or a barbecue. This is also where “le rocher qui repond” climbing site is. We often drop some of the team off at La Vachette and organise the shuttle whilst the keener members continue down to Briancon. If you are doing this go back into the village and take the track which goes under the main Briancon -Montgenevre road. The track then continues on the river right of the Durance high above the Class V rapids. At one point the track follows an irrigation channel and becomes a narrow single track. There is also a bit of climbing. Finally one reaches the track from Briancon to the Fort des Trois Tetes which descends down the Pont d’Asfeld – which is some 60m above the Durance Briancon Town Gorge. As this section is more technical and physical the younger children might find it a little difficult. This mountain bike ride starts at the Col du Lauteret and if completed in full ends in Briancon, a ride of some 28 kms. The first section has quite a steep descent so is quite hard on the brake hand, although it is not particularly technical. After le Lauzet it is follows an easy path which is relatively straightforward. Keep following the GR54 to Monetier; skirt around the back of Monetier by the ski lifts and take the back road to Le Bez. You can always stop off here at Adventure Park if you have children with you. At Le Bez there is also a Plan d’Eau. See Children’s Activities. Take the small road through Le Bez /Villeneuve, staying just below the ski pistes and as you climb up there is then a track which goes off to the left. Take this and follow it through to Chantmerle. At one point you have the choice of maintaining height and following an irrigation channel. This is a great single track ride, but some people will be put off by the potential of falling into the ditch. Continue on – crossing the ski lifts at Chantmerele. If you fancy there are scooters you can hire which you can take up the lifts and shoot down the hill. You now reach a major track. Continue down this to the bridge at .Cross the bridge and then continue down the Guisane on river left. From here you get an excellent view of the Class 4 section of the Guisane. Once you arrive at a road, follow this up for a few hundred metres then take the track off right and you then arrive at the main Briancon road. This section is slightly more technical but excellent fun. This is an easy ride which can be linked with other rides described in this section. However it is an excellent ride with children and is a great way of inspecting the Onde before paddling it and if paddling it, it is the quickest way of doing the ferry. At this point you have a choice. Either cross the bridge and follow the main track back on river left. Alternatively take the smaller track and follow the river right. This is quite a lot more technical. There is an excellent ride up the Gyronde valley the Bar Rif (the bridge which crosses the Gyronde where the road goes to Puy St Vincent 1400) to Vallouise. This track follows the river right and is generally very easy but pleasant total Distance in each direction is approximately 5km each way and a height difference of approximately 80m. From the Bar Rif you can also descend further down the Gyronde to the bridge at the bottom of the valley (2km) Just one hundred metres down the track from the start here is an excellent piece of single track which drops off to the left and follows the river (river right) and ends up at the toilet facilities in the campsite. Here you can cross the bridge and follow single track through the woods on the other side (river left) of the river At the bridge at the bottom you can cross this and either ascend the road or take a left track off which climbs steeply and follows the hill-side around to our house in L’Argentiere. This is an excellent piece of single track with quite a long climb and afterwards a traverse with some big drop offs to the left and a steep descent 2km. This is a lovely mountain bike ride down the Fournel, most of which is single track. The are some short technical sections. There are also some sections where the track falls off quite steeply to one side. The descent to L’Ubac is also quite steep. You need to be a reasonably good and confident rider. Follow the road up to the Fournel valley. You pass the silver mine , the climbing sites and the start of the canyon You cross to river right. This then becomes a forestry track. You cross to river left and pass the turn off for the Col du Pousterle and keep on going to the end of the road and the site of the Chardon Bleu. We tend to drive this rather than cycle it and do a ferry. This is a lovely track, mainly single track. Keep on the river right until you reach this bridge which goes over the river just by the turn off to the Col du Pousterle. Follow up the road to the Pousterle and take the first track to the right. This is a narrow track with quite a drop off on the right hand side. It then reaches some old huts and joins a dirt track which descends to the road. Cross over to river left and follow this. You hit the road, follow this down and at the next bridge keep river left. This is a narrow track with quite steep drop offs and as it reaches the Ubac does descend quite steeply. Either descend the road or follow a series of little tracks which descend quite steeply. We also do a ride which is technically quite difficult which traverses from the Col du Pousterle through the ski de fond tracks to Puy St Vincent 1600, then into the Narreyoux valley; from there down towards the Onde on a series of very steep switch backs; cross back to above Puy St Vincent 1400 using the tracks which follow the irrigation channels and then join in with the GR50. Although this is an excellent ride, it is rather tiring on the brake hands and the nerves! This is suitable only for the expert riders.